What a perfect gift for the Father or man who has everything! 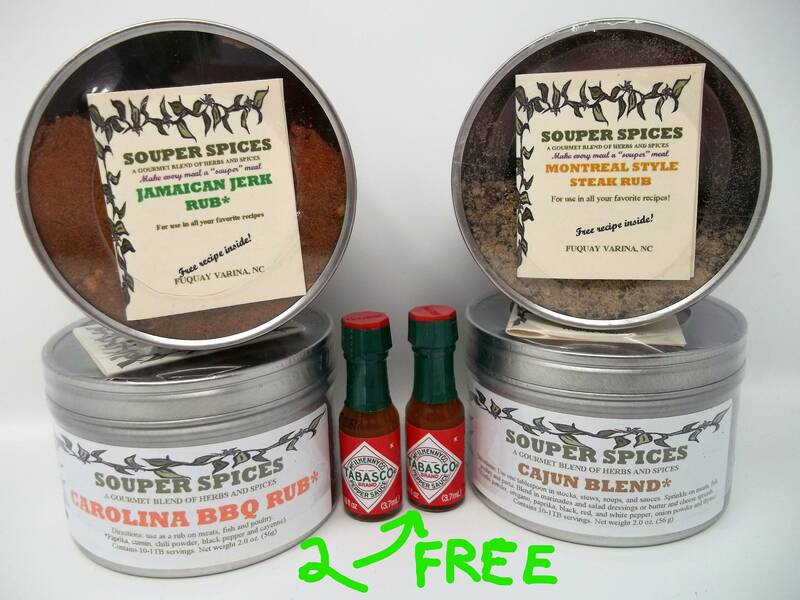 You get 2 full ounces of each (1/2 pound) of my favorite spice rubs combined in one box AND 2 FREE mini Tabasco Sauces at no extra cost to you!!! I do the shopping and all you have to do is order, although if you want to choose your own four blends, please let me know at check out or use my special order box. I don't care where you live, but we grill all year round with the occasional bag in the oven, which is delicious too. If you still want to get that grilled flavor, place your ribs on a preheated hot grill and char (this only takes seconds), put in the bag and oven roast according to the directions. This is not just for steaks! Rub it on pork, chicken or hamburgers before grilling for a delicious, spicy change! My Husband, Vic, is a Cajun master and loves this recipe. He has perfected it and it is such a delicious meal that is fast and easy to prepare. This is a blend of different peppers and spices SPICY HOT. I found this on the internet and it made me laugh so I had to pass it on. Why is jerk chicken called jerk chicken? Great Christmas gift for my dad! Shipped very quickly and they all taste delicious! Brother in law loved this gift! Very excited to try them out! I got this as a gift for my father, as he as a Big Green Egg and is an avid griller and smoker. He loved the rubs as soon as he opened them, and I was very happy with the size of them. I’ve ordered from other sellers before and they were tiny canisters, good for about one use. I would definitely order from this shop again.